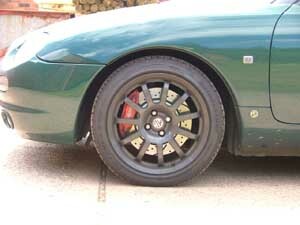 Why have big brakes on your MG? 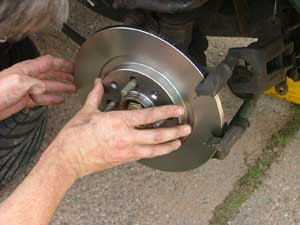 If you had a properly set up brake system, you could probably pull an F to a halt with discs the size of 50 pence pieces in practically the same distance as the same car with discs the size of dinner plates. 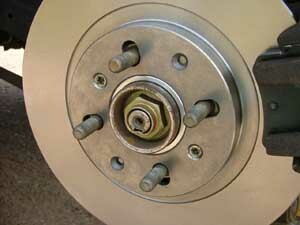 Big brakes are heavy too – increasing unsprung weight. 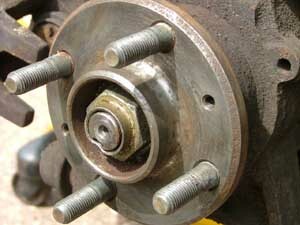 The way I look at this, unsprung weight describes that mass of metal at the end of the axle – the wheel, the tyre, the hub. The heavier this is, the harder the springs and dampers have to work to keep them under control after bouncing over bumps. 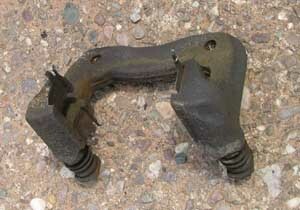 Lower the unsprung weight, the easier it is to make a car handle and ride well. 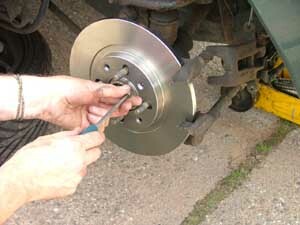 Big brakes are also expensive – not least because you’re looking at much more material being incorporated in them. 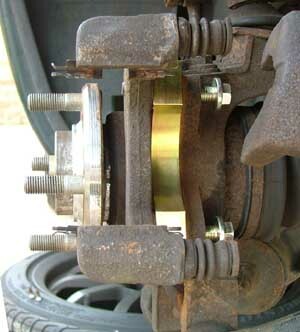 Big brakes can be a hazard. Why on earth would anyone want big brakes? 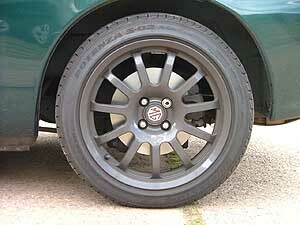 Putting aside marketing (go on, admit it, you love the look of huge brakes behind those shiny alloys of yours! 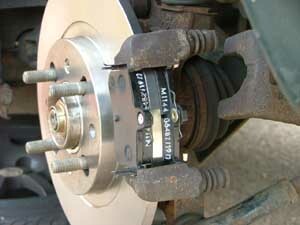 ), big brakes do have a purpose. It’s all about heat. 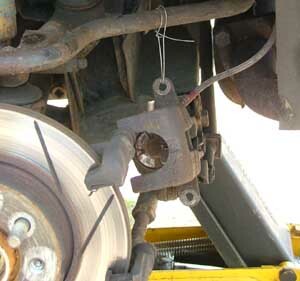 While those 50pence-sized brakes could probably lead to wheel locking just as effectively as a big brake, they’d get so hot that they’d probably boil your brake fluid and probably ignite the friction material on the brake pads. Brakes convert kinetic energy into heat – and if you’re travelling fast, there may well be vast amounts of energy to disperse! 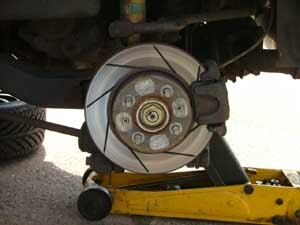 Big brakes have an advantage: their much larger surface area means that they can shift much more heat in a much shorter period – which is ideal of a high performance sports car that is being used heavily on the track or on the road. But ultimately, they won’t stop your car any faster than an otherwise identical, smaller disc-equipped car. 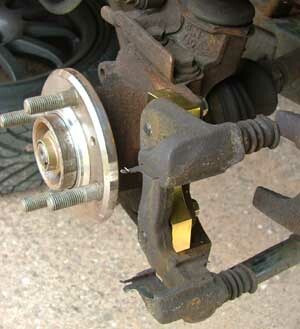 That said, the greater braking leverage that is to be gained from applying a retardation force at the edge of a larger disc means that for any given brake-pedal movement, you will get more stopping force applied. Unsurprising then that we all feel that big brakes mean more stopping power – but this is a subjective impression, and not the reality. The funny thing is, the ultimate limiting factor of the rate of deceleration you get from brakes is not the braking system at all. It’s the tyres! 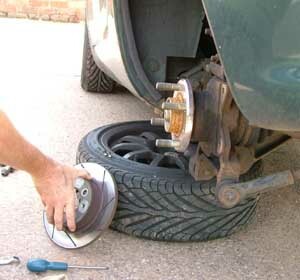 No matter how heavy or light the car, the braking force is limited purely by how much grip your tyres can generate; the vehicle’s mass is simply not part of the equation. Stunning front AP racing 304mm front rotors and red-painted, MG-logo'd 4-pot calipers. What's not to like? 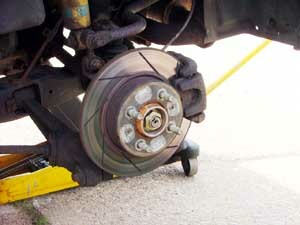 So why are we writing an article about big brakes in FTF? Well, MG started it. They started fitting 304mm AP Racing 4-pot calliper brakes to MGFs and then TFs. You have to agree that they do look sublime. The odd thing was that they did absolutely nothing about the rear discs. MG didn’t even bother altering the settings of the brake bias valve. Why should this matter? If the MGF and TF were a front engine car, then actually it probably wouldn’t matter at all. In a 1G stop (the same rate of change of velocity you’d feel if you’d jumped off a cliff edge), a front-engine car would load up its front wheels due to weight transfer effectively leading to 80 or indeed 90% of the work being performed by the front wheels. An MGF is rather different. 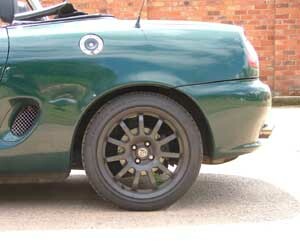 It’s weight distribution is rather more rear biased (55% of the MG’s weight is over the rear wheels! 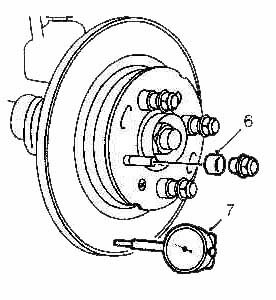 [more]), meaning that under the same circumstances, the rear brakes are still playing an important role in slowing the progress of the car even during a 1G stop. Estimates suggest that the split is something more like 60:40 front/rear under these conditions. You can read more about this here. Which is where my problem with the big front brake kits comes in. When ever I have driven cars fitted with the 304mm front disc, I have found that that is just too easy to lock the front wheels – it’s as though the rears simply aren’t pulling their weight in the stopping department. Given the mismatch in braking torques between a 304mm and a 240mm disc, this perhaps is not surprising. Frankly, a standard set up using race-bred pads all-round is far, far better from this balance perspective. 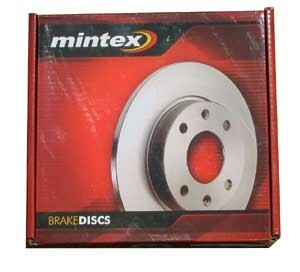 One solution for the big brake imbalance is to fit more aggressive rear pads – say Mintex 1177 to Mintex 1144 at the front. But as anyone who is familiar with the 1177 pad will testify, they eat discs, and cover everything with tenacious pad dust… not ideal for a road car. 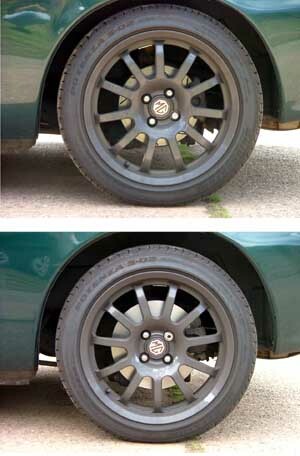 Top: before with standard sized 240mm rear discs and bottom: the new VHS 280mm rear disc conversion. The only other solution is to fit a larger rear disc. And given that 240mm discs look lost behind 16” wheels, there is an undeniable aesthetic justification for going down this route too. It is probably no coincidence that this yawning chasm of a gap in the market has, until very recently, been left unfilled. 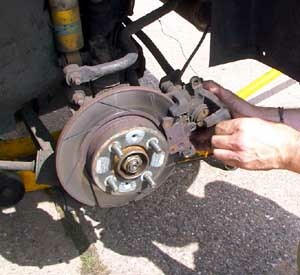 Get your rear brakes wrong, and you run the very real risk of dangerous over-braking of the rear wheels and consquent rear lock up. Get rear-end lock up on entry to a corner, or even mid corner, and you’ll be saying a big hello to the scenery (and everything that Bill Oddy holds dear) as the rear of your MG goes hedge trimming. Dangerous. 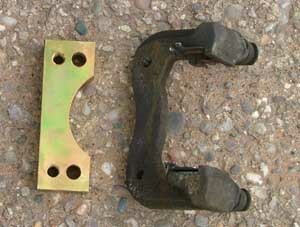 Brake design is probably best left to the professionals. Which is what the MGF Register has done. 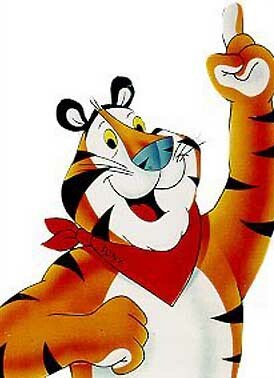 And these guys have come up trumps. And as you can see from the picture to the left, the larger rear discs are worth fitting for the looks alone! 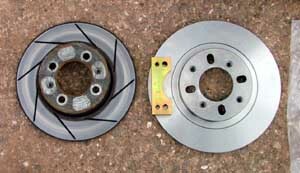 On the left is the standard-sized 240mm rear disc. On the right, the new 266mm rear discs. They don’t look quite so puny any more do they? 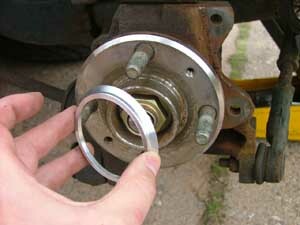 So you are interested in fitting these discs, how do you go about it? First task is to move your car onto solid level ground. As with MG’s ageless paraphrase goes, safety first. 2. Now raise the rear of the car up onto axle stands and remove the road wheels. 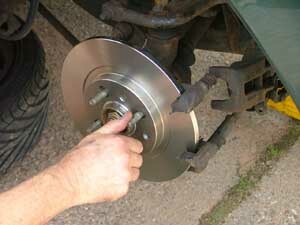 With the road wheels removed, we can now gain access to the brakes themselves. 3. 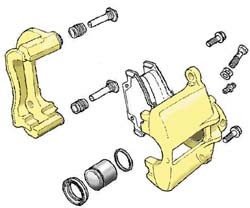 Disassemble the brake carrier – there are two 8mm sliding bolts to undo – and once done the outer pad carrier can be removed, along with the pad, as shown below. 4. 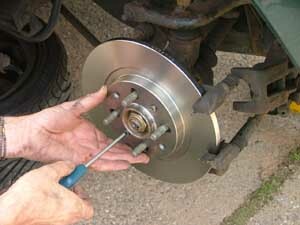 Next remove the calliper, swinging it up and away and secure on some wire (an old coat hanger is ideal for this). 5. 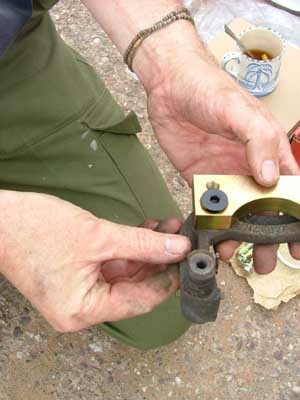 Next identify remove the bolts retain the calliper to the hub carrier – in the image to the right, we see that Wayne has already put a socket onto one of the retaining bolts. 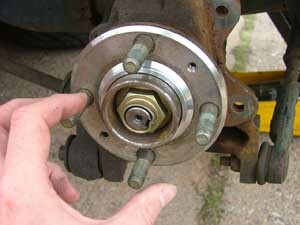 Remove both bolts, and remove the calliper carrier. 6. Now remove the discs – mine came off very easily as they had been replaced fairly recently (oh well). 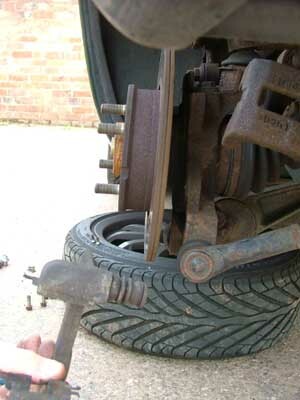 The steps not shown here are removal of the two set-screws that are fitted to help locate the disc to the hub, and the ‘gentle’ persuasion required to release the disc from the hub – this may require some thumping with a lump hammer, rotating the disc through 90 degrees between clouts to release. 7. 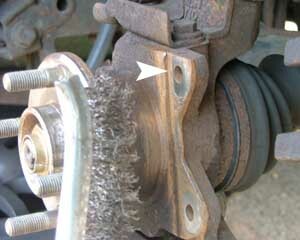 Now clean up the hubs with a wire brush to remove any loose rust or dirt from the hub mounting surfaces. You’ll notice that the hub is nice and silver- that’s because this was replaced very recently following a track day at Brands Hatch; the bearing had completely failed – a known weak point in the MGF chassis. 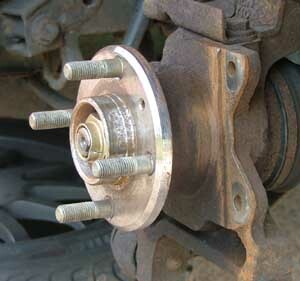 Here are two close up pictures of the rear wheel hub. On the left, you'll notice that the centre locator spigot has a rounded appearance as it meets the mating face of the hub. On the right is the other design, which is squared of, and has an additional ridge. 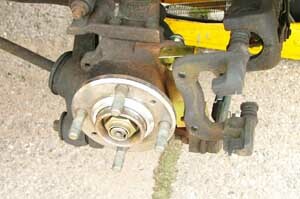 Thus, as can be seen, there are in fact more than one design of hub – but they all share one part number as far as I can make out and appear to be fitted randomly to either side of the vehicle (for instance my car had both designs, differing from one side to the other – which makes things very confusing! 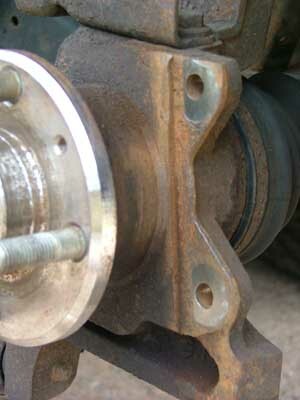 …the round-shouldered hub as pictured here (this happens to be the hub on the opposite side of the car on my MGF - as mentioned above in point 7). The ring adapter simply slides neatly into place. With the disc bolted in place, it is sandwiched in place, so isn’t going to go anywhere! … and now the calliper can be mounted into its new position somewhat further displaced from the centre of the hub than before. 12. 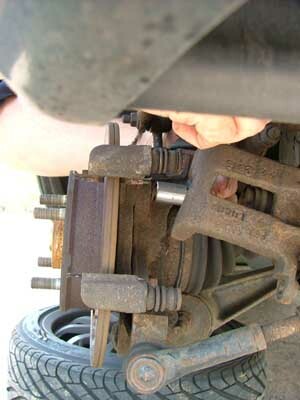 Replacement calliper carrier bolts are supplied with the kit – and here we can see the assembly being bolted into position. 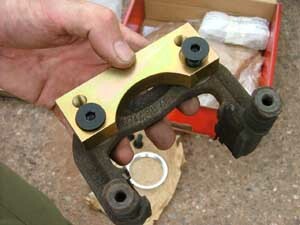 Job done: calliper carrier now securely bolted into place. 13. Now we can slide the new larger disc into place. The retaining screws are now fitted to bring the disc into the correct position. Disc rotated through 360 degrees several times to ensure that there is no significant ‘wobble’ or ‘run-out’… You can use a dial position indicator (DPI, arrow 7 below) to ensure millimetric location precision. 14. 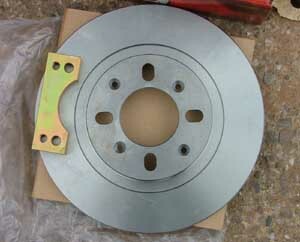 Satisfied that the disc is true when rotated, the calliper can be reassembled… First with nice, new Mintex 1144 pads. 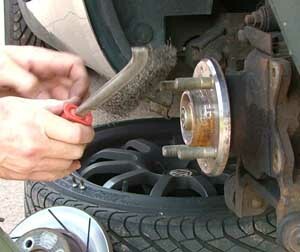 Here Wayne finishes off the job – calliper now back in place. Perhaps we should have given the calliper a lick of paint before refitting? 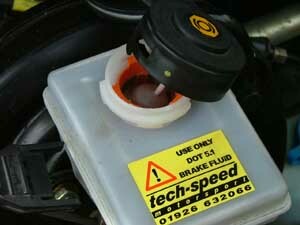 You could certainly do this when working on your own car. 16. Close up of the completed disc and adapter assembly – it could almost be standard equipment couldn’t it? And now with the road wheel fitted, looking absolutely stunning. 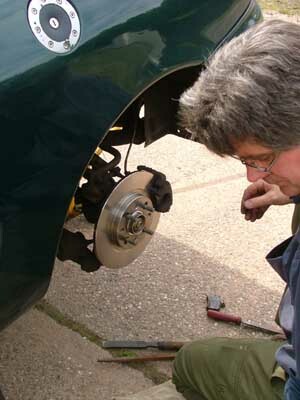 Big rear brakes fitted – worth doing? The answer to this is definitely yes. Some would argue that they’re worth fitting for the aesthetic value alone – those discs no longer look lost behind 16” alloys in the way that the original 240mm items did. But that wasn’t the reason for fitting them. The real proof of the pudding is on the road and track – and I have to say that the brake balance with these discs is simply brilliant. You can really heave on the middle peddle without fear of inducing premature lock up of the front wheels – the rears also mean that the total retardation is ultimately great than if you were braking using the front wheels alone. 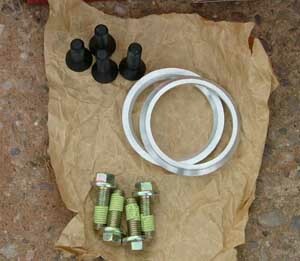 And I am hopeful of additional benefits too – compared to my old brake set up, I am hopeful that these discs will run a good deal cooler, which ought to be good news in terms of brake disc and brake pad longevity, not to mention the life span of the rear bearings themselves.